This is what i sent to the admin's. My guild has now killed Onyxia two times. Both times we have been unable to complete this quest. We followed all of the instructions we were given after our last kill. We cleared out caches, we dropped the quest and picked it up again. 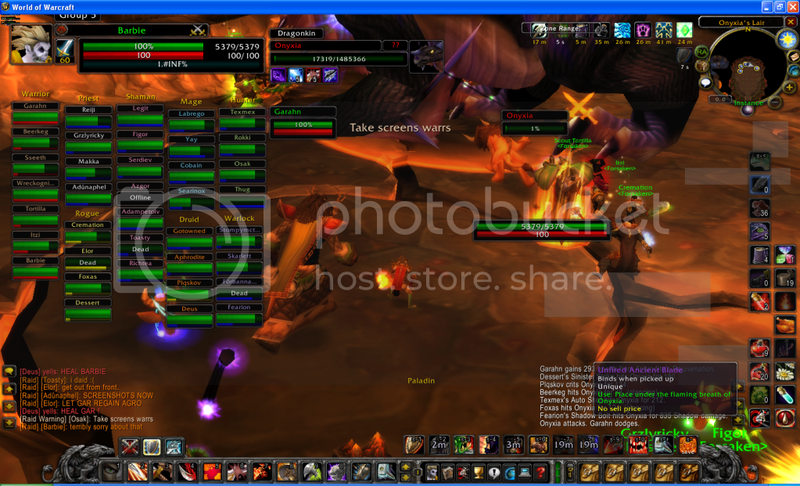 We also took Screenshots of the fight with Onyxia at low health and with the swords in our inventory. After the fight, the sword or quest item, whatever was intended to give us the quest completion was not there, and the quest was not completed. Here are links to the screenshots my tanks took. We would really appreciate getting our swords, as we have done everything that was asked of us, which tbh is a bit more difficult then the quest was on retail in how much effort we had to put into it. Our warrior Wreckognize was also present at the raid with the sword but his screenshot did not save correctly and was lost. He took a SS slightly afterward with it which can be found at (http://tinypic.com/r/15dqdqp/6), and if you would give him his sword we would appreciate it, but we understand if you cannot. We would truly appreciate your help in giving us these swords, we've done a lot of work for them and we've follow your requests. If you need tto question me in game I am Garahn, the guild leader of . Re: This is what i sent to the admin's. Looks great. I hope they will help us and give us our swords. You can see wreck's damage in itzi's screenshot. He is right under barbie. That might be as much proof as we can get that he was in the raid and fighting onyxia. May not be enough though. Well as I told Gar, just trading the sword to a GM at onyxia when she's dead should be enough proof. but we'll see what happens, if someone who needed it can't get it this time then theres always next week.